Something about the lens is very akin to the human consciousness which looks out at the universe. "I am a camera" - we are all cameras. We are recording eyes, you know, we look out and record and we use our consciousness to do this. The motion picture camera is the [tool closest] to the human sense of observation and sense of the universe. When the men land on the moon, I land on the moon - because I am conscious of it, and I take it into myself, and I am landing on the moon. This is what happens with a motion-picture camera. It approximates the consciousness that everyone has. /.../ And the motion-picture camera is the really solipsistic instrument for awareness and realization. There is a moral dimension to it. Once you have seen something you are aware of it, and being conscious of it you can no longer avoid it or deny it. Vidor mentions the war in Vietnam as an example ("You can't just say, 'that war over there' - way off in Asia. You can't say that any more.") With awareness comes responsibility. 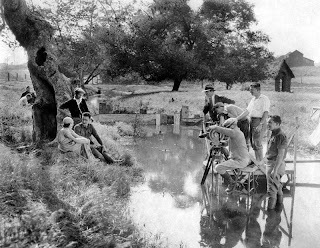 The heroes of Vidor's films are those who take responsibility, and who create, be it a farm, an industry or a work of art. To live is to create. 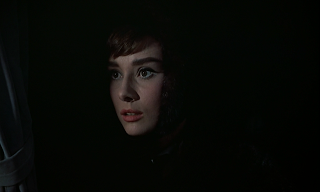 Natasha (Audrey Hepburn) sinking into darkness after being told her beloved Andrei is dying. War and Peace. Filming John Gilbert and Renée Adorée. The Big Parade (1925). The quotes are from Richard Schickel's interview with Vidor, published in The Men Who Made the Movies. He had an extraordinary long career. He made his first short films in 1913 and his last in 1980. The oldest film of him I have seen is Wild Oranges (1924), which is unknown but very good. Barack Obama was widely celebrated all over the world in 2008, including by the Nobel peace prize committee, and to a large extent this was because he was not George Bush. Rather he was seen as the antithesis of Bush. Something similar seems to be the case with the new Pope, Francis, who is today almost as globally celebrated as Obama once was. Part of that is of course because of who he is, but part of it is also who he is not, i.e. the previous Pope, Benedict XVI. As it happens the new film by Stephen Frears, Philomena, does in some ways capture the difference between the two popes, and two different ways in which you can practise your Catholicism. I am not a religious person, and I belong to no church, but these are still questions that interest me. Philomena is about an English ex-journalist, Martin, who gets word of a story about an Irish woman who had a child when she was young and unmarried and who after giving birth at a convent was forced to work for the nuns and her child was given away (or rather sold) for adoption. Now 50 years later she wants to find out what became of her child, the son she has not seen in decades. She is a religious person, a Catholic, secure in her belief in God, and she has nothing against the Catholic Church, she just wants to find out what happened. The journalist was once a Catholic but now he has lost his faith and become an atheist. He is also filled with anger towards the Church (and a lot of other things as well). In the film they are played by Judi Dench and Steve Coogan (who also wrote the script) and it is based on a true story. Martin Sixsmith, the journalist, told the story a few years ago in the book The Lost Child of Philomena Lee on which the film is based. The film has been condemned in some quarters for being anti-Catholic. It is clearly not. Another criticism it has received concerns Sister Hildegard, who in the film becomes the embodiment of cruel, pitiless catechism. In reality she died many years ago and cannot be held responsible for what happens towards the end of the story. But by making Hildegard out to be the villain the filmmakers does shift the burden of blame. Instead of arguing that it was the Church as a whole that was in the wrong the film could be said to argue that it was a question of a few rotten apples. 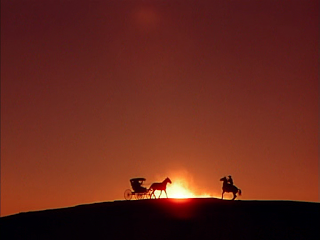 It also makes for a very emotional scene towards the end of the film, which is fictional, but which is where the potential symbolism of the two popes appears. Philomena Lee and Sister Hildegard are both devout Catholics, but one is kind and forgiving whereas the other is stern, stubborn and judgemental. They are each other's opposites, and that is what makes the film such an interesting theological statement. What is the true Christian spirit, to judge or to forgive? Which of the two does a better job of upholding the teachings of Jesus Christ? The film has its answer. This is not to say that Hildegard is less of a Christian, it is just that she emphasises different aspects of Christianity, and is perhaps more Old Testament than New Testament. The new Pope has since he was elected in March 2013 been doing a remarkable job in improving the reputation of the Holy See and the Catholic Church. He has done this through words and actions. He has shown himself to be a man of the people, of being a man with simple tastes, a person who will embrace anyone. He has also instigated a number of reforms in the Vatican. But it is also in his choice of words and emphasis. 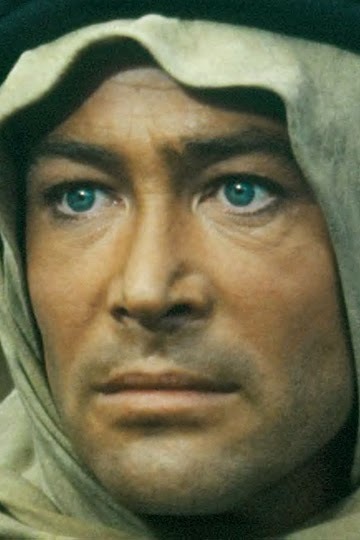 The most famous instance was perhaps when, asked about homosexuals, he answered "Who am I to judge?" That could also be Philomena Lee's position. Francis is clearly a Pope for her, a Pope she deserves. And he is also the opposite of the previous Pope, Benedict. Benedict was in favour of lavishness and he was concerned with righteousness and dogma. It is much easier to imagine him saying "I am the Pope, therefore I can judge you." rather than say "Who am I to judge?" In this way Benedict is more like Sister Hildegard (even though she is materially as humble as Pope Francis), and it is timely that Philomena comes out the same year that Francis has replaced Benedict, openness has replaced judgement, dialogue has replaced submission. In 1962 Pope John XXIII initiated the Second Vatican Council in order to reform the Catholic Church and bring it more in line with the modern world. In this it had some success, but there have been backlashes and it was not popular among more conservative Catholics. Maybe Francis will manage to make the Catholic Church a more inclusive and loving church. It is not only a concern for Catholics for what the Pope says and does is (regrettably) important far beyond the Catholic world. Many headlines have been made concerning Pope Francis's views on capitalism, poverty and inequality but this is actually one aspect of his papacy that is not different from his predecessors (but rather a sign of the short memory of journalists and commentators). Pope Benedict had this to say about a year ago: "The world is sadly marked by hotbeds of tension and conflict caused by growing instances of inequality between rich and poor, by the prevalence of a selfish and individualistic mindset which also finds expression in an unregulated financial capitalism." And his predecessor, Pope John Paul II, argued that "[v]ast multitudes are still living in conditions of great material and moral poverty. /…/ Indeed, there is a risk that a radical capitalistic ideology could spread which refuses even to consider these problems, in the a priori belief that any attempt to solve them is doomed to failure and which blindly entrusts their solution to the free development of market forces." There is also the filmatisation of Joseph Conrad's Lord Jim (Richard Brooks 1965), The Stunt Man (Richard Rush 1980), two appearances as Henry II (Becket (Peter Glenville 1964) and The Lion in Winter (Anthony Harvey 1968)), the enchanting How to Steal a Million (William Wyler 1965), with Audrey Hepburn, and much else, often playing kings, bishops and men of authority, but sometimes only being a voice and often letting himself go in silly farce. By above and beyond all else there is Lawrence. Where would I be today with him? Actors never die, they just exit the stage. I have seen less of her later work, which was mostly on TV from the 1950s and onwards. Among the films I have seen are The Bigamist (Ida Lupino 1953), Beyond a Reasonable Doubt (Fritz Lang 1956) and Until They Sail (Robert Wise 1957), this time playing a New Zealand woman, one of four sisters during World War 2. The films are all good, but of these three I have a particularly weak spot for Until They Sail. Here are two clips, the first is from Letter From an Unknown Woman, the second from Suspicion, although admittedly it has more of Hitchcock than Fontaine in it. 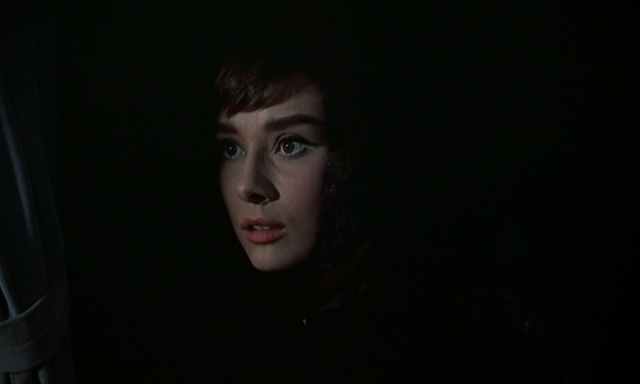 She did win an Oscar for that part though, the only time anybody won an acting award from being directed by Hitch. The Great Escape is a number of things. It is a POW-film, it is a war film, it is a buddy film while also an ensemble piece, and a film about resilience and the urge for freedom. And based on a true story, although, as is usually the case, the true story has been altered for various reasons. Some changes have been made for efficiency, some for drama, some on requests from the real people involved, and some out of convenience I suppose. But the basic facts are the same, hundreds of allied prisoners worked together to escape from a German prison camp in 1944. 76 managed to escape before the guards sounded the alarm. The real escape project took about a year, making the film took about four months and the film is three hours long, and it is never dull. It takes its time, being methodological and patient, but it gives time for the characters to grow and learn, to befriend each other and interact, and share moments of both joy and terror. In that respect it is a very humane film, where even the German commander of the camp (played by Hannes Messemer) is a human being, trying to be kind and just and often appalled by the horrors and loss of life that is part of war. That the characters are almost all played by big stars, British and American, does not matter for with the exception of Steve McQueen they all become their parts and disappear into the group. Among them are James Garner, James Donald, Richard Attenborough, Charles Bronson, David McCallum, Donald Pleasence and James Coburn. The force behind the film is John Sturges, who produced and directed it at the height of his career, riding on the success of Magnificent Seven (1960), and he was intimately involved in all aspects of the film. To some extent it was his baby, and the decision to shoot it in Germany instead of in Hollywood is undoubtedly a big factor in the film's appeal. It was a very complex project, logistically (for example they built a whole prison camp outside Munich) and personally, with a lot of issues and difficulties among the cast. It is not Sturges's best film but it shows his skills and his particular concerns (like how the film manages to be uplifting and downbeat at the same time). Sturges had problems with Steve McQueen who apparently was very insecure, and testy, on set. But that does not come off in the film as he is one of the best things about it, if not the best thing. He stands out because his character Hilts is a loner, who spends most of his time in "the cooler", an isolation cell, where he sits for days on end throwing his baseball. (Hence he was called "the cooler king" in the film, which may have led to McQueen being called "the king of cool".) The story was changed to a large degree to accommodate McQueen and the sequence with him on a motorcycle was invented, almost on set, and a good thing too because that sequence is a highlight of the film. 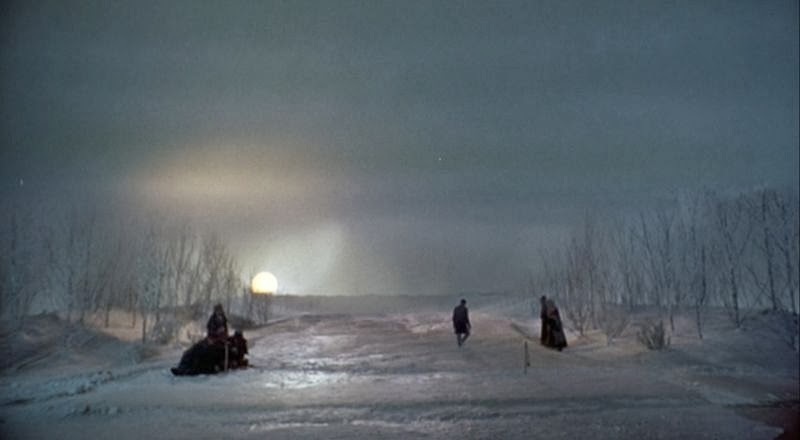 The whole film is, as I said, about resilience and the urge for freedom, and nothing captures this like Hilts stealing a Triumph from a German soldier and heading for the Swiss border. There are several things here that work together. The fact that it is real, no digital effects or studios, but McQueen on a motorcycle in Germany (the actual jump through barbed wire was done by Bud Ekins for insurance reasons) is one thing. Another is the way the landscape and the motorcycle work together. Sturges keeps the camera far from the action and pans left and right to show how small the men and their vehicles are compared to the mountains and the hills. And then there is the sense of freedom, in two ways. Hilts alone on his bike, instead of in an isolation cell, is one aspect of freedom, physical freedom. The other is more spiritual. He does not make it, he gets caught in the barbed wire and is captured by the Germans, but in the moment of defeat he smiles. The Germans may have captured his person but his spirit is not caught or broken. He has not given up. He will live on, to fight and to escape again. An earlier post about Steve McQueen is here. 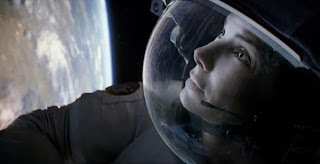 For another post about human resilience see the one about Gravity. 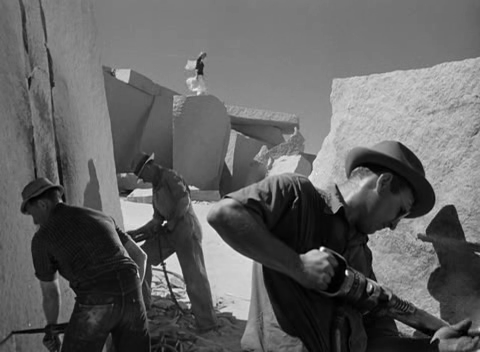 There will be more about John Sturges in a post next year. This post is part of a join venture for Filmspanarna, a collection of film bloggers from Sweden. Here are links to the other participants posts on The Great Escape. The first is in English, the others in Swedish. The Velvet Café, Jojjenito, Rörliga bilder och tryckta ord, Movies-Noir, Moving Landscape, Fiffi.We saw the film at Cinemateket in Stockholm so we could experience it on a very big screen. It is occasionally said that the only thing that would unite all of humanity would be an attack from outer space, making us forget our national borders. One nice thing about Gravity is that there are no borders up there. Dr Stone moves from a US space shuttle to the primarily Russian ISS to the Chinese space station Tiangong (which at present is much smaller than in the film), and Earth as seen from space is a unified planet, where it is impossible to see where one country begins and another ends. It is even impossible to see that there are countries. But even though space is without borders, language is still an issue. Dr Stone has difficulties since she cannot read Russian or Chinese. But the main thrust of the film is concerned with survival and life itself. Perhaps even the meaning of life. There is very little story in the film other than one person's frantic effort to stay alive, and the same person's acceptance that she will die. I do not believe that there is some larger meaning to our lives, or that there need to be one. But Gravity does suggest one, that the meaning of life is to live, to survive. And I like that. 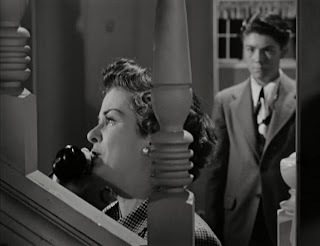 When watching it the second time I thought, strangely perhaps, of Max Ophüls's very great The Reckless Moment (1949). There a housewife fights a relentless battle to keep her daughter and herself out of harm's way, in the form of a blackmailer. It was the simplicity and straightforwardness of the stories, one person's epic battle against an increasing amount of obstacles combined with elaborate camera work - very long takes with a moving camera with plenty of activity going on in the background and where the environment itself is an enemy, that I suppose made me think of them both. But there is a key difference. In The Reckless Moment it is specifically a woman's fight, in Gravity it is a human, rather than a woman, who is taking up the fight. In Swedish we have a gender-neutral word, neither han (he) nor hon (she) but hen (I wish there was an English word) and it is suitable here, not least since Ryan Stone is a woman with a male name. Dr Stone is fighting the fight as a representative of humanity, all alone. And Sandra Bullock's performance is superb. Despite being something of a disaster movie the film is actually uplifting and affirmative. While I thought there was too much music in the film as a whole, in the final minutes the music was perfect, signalling the triumph of the human spirit and the exhilaration of being alive. When Dr Stone lands it is on Earth, no particular place but Earth itself, almost like an alien life form, or the first mammal coming out of the sea. Humanity is reborn. The film is a celebration of the will to live, and of the human capacity to survive. It is also a testament to the human capacity to create both art and technology. The same capacity that also managed to build a spacecraft that can travel beyond our solar system. Why build it? Because we can. Why live? Because we can. Cuarón has a response to my complaint about the music. "I knew we needed music to convey a certain energy, and while I’m sure there would be five people that would love nothingness, I want the film to be enjoyed by the entire audience." he said in an interview in Wired. There has of course been a lot written about the ways Gravity is unrealistic. Personally I was annoyed by the way Kowalsky (George Clooney) was killed off. There was no force dragging him away from the ISS, even though he disconnected the wire he would have remained where he was. But it does not really matter. Narrative expedience is sometimes more important than complete adherence to the laws of physics.